Vali has over 15 years of gymnastics coaching experience. Born and raised in Bucharest, Romania, he was a Romanian National Champion as a competitive gymnast, retiring at age 18 to pursue coaching. As a gymnast, his accomplishments are many, with titles including National Champion, National Vice-Champion, International Vice-Champion, and Junior National Champion. He performed gymnastics at Dinamo in Bucharest, Romania from 1989-2002 and subsequently studied gymnastics coaching formally at the National Academy of Physical Education and Sports in Bucharest from 2002-2007. After obtaining his University degree in coaching, Vali went on to coach at C.S. Dinamo . His gymnasts, both male and female, achieved numerous Championship titles, including all-around, team and individual apparatus National Champions, National Vice-Champions, and Junior National Champions and squads. He is the former coach of Paula Tudorache who competed for the National Gymnastics Team of Romania at the 2014 World Championship, Nanning, China. He immigrated to the United States in 2013 when he was recruited as a skilled gymnastics coach. For the past 4 years in the United States, he has been successful in building a highly competitive men’s gymnastics program quite literally from the ground up with team members receiving numerous awards at the state and regional level, and in 2016 an athlete qualifying for the USA Men’s Gymnastics National Championship. As a result of his success, he has been invited to coach at camps and clinics in Minnesota and throughout the Midwest. Vali is now excited to be pursuing his dream of owning a gym with goals of building a team program with gymnasts capable of being competitive on the national and international stage. Zach has been coaching gymnastics since 2007 with a primary focus on boys’ team. His involvement with the sport started over 25 years ago as an athlete, his most notable success being a first place finish in the all-around at an MAGA state meet in 1995. On top of coaching boys’ competitive gymnastics, Zach has a lot of experience coordinating and coaching preschool and recreational programs. He’s also coached girls’ team and training team. And for the last 6 seasons, was head coach for a Special Olympics gymnastics team. Zach is from Cannon Falls, Minnesota. He has an M.A. degree in history from the University of New Brunswick and has been the Director of the Cannon Falls Museum for the past 7 years. When not coaching or doing historical work, Zach spends time with family and friends and enjoys working out, doing handstands, bouncing on trampolines and pursuing outdoor hobbies like hiking and fishing. Having graduated from Winona State University with a Recreation and Tourism degree in 2017, Carly values the importance of recreation and leisure in creating a healthy life balance. Although she doesn’t have a past in gymnastics, working as the Executive Assistant and Events Coordinator at ROGA gives Carly the opportunity to pursue her passion for recreation, events, organization and assisting others. On her days off she enjoys spending time with her 2 cats, getting lost in art projects, playing ukulele, and attending as many events as she can. Steve has had a lifelong passion for gymnastics, which started when he was a gymnast in the late 70s and early 80s. He has four years of coaching experience with both boys and girls, from pre-school to upper levels. He’s a USAG-certified coach and certified in CPR. His main responsibilities include: Excel Girls Team, pre-school classes, and office/facility management. As a coach, he says there’s nothing more rewarding than helping a child reach their gymnastics goals. Away from the gym, he likes to spend time with his wife and four children. Steve is a US Army captain (retired), loves to fish and woodwork, and spend time with friends and family. Coach Matt is a former Marine and U4 army specialist, with over 20 years of martial arts experience under his belt, including being a certified hapkido instructor. After a gym with a shortage of gymnastics coaches offered to train him, he decided to give it a try. Twelve years later, he still has a passion for coaching Gymnastics. In his free time, Matt enjoys spending time with his 5 kids, playing drums, guitar and mandolin, and spending as much time as he can in nature. 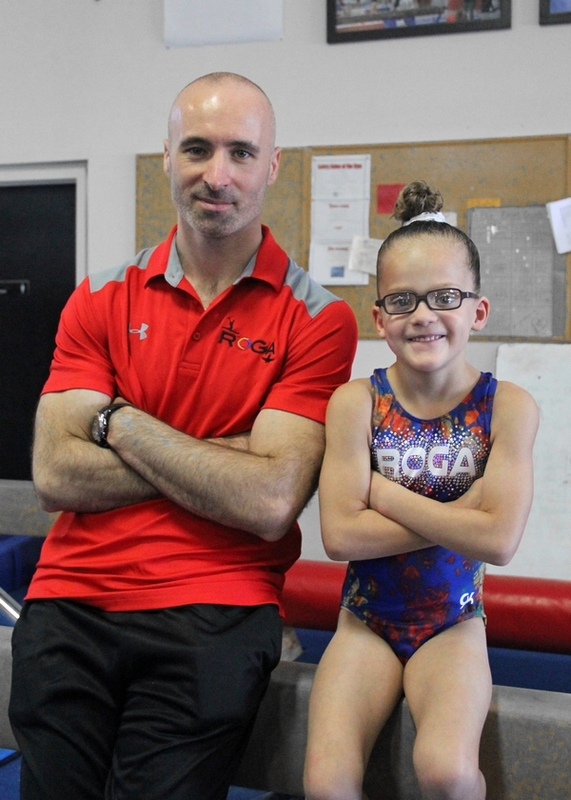 Although Eric mostly sits at a desk these days running the numbers for ROGA and his tax and accounting clients, a long time ago, Eric was a high school gymnast. He competed in the all-around for Robbinsdale Armstrong High School. Eric placed 3rd on Vault at the MN State High School Championships in 1989 and was the Compulsory Parallel Bars State Champion in 1986. Eric is a fill-in coach at ROGA, coaching Level 4-6 boys teams and rec classes as needed. Away from the gym and his accounting practice, Eric is an avid cyclist, plays soccer, loves to travel and be social, and never misses an opportunity to catch a good movie, hike or adventure with his wife and four kids. With a schooling background in English and Mass Communication, Michelle has always had an interest in planning, coordinating, writing, and creating. She has been dancing competitively since she was 5 years old. Team athletics led her into a position as a fitness instructor, which she has now been doing for 6 years. She enjoys her growing position at ROGA as a receptionist, coach, event coordinator, and more to come! During her time off she enjoys going for walks, finding new adventures, working out, escape rooms, board games, coloring and spending time with her two puppies, her friends, and her family. Coach Sophia is currently enrolled as a sophomore at the University of Minnesota Rochester, pursuing a B.S. in Psychology. She was a club gymnast for 11 years before suffering a career ending injury. She is grateful to be able to continue her love and appreciation of the sport through coaching. Coach Zach has been involved in gymnastics since age 7, including four years of competition, finishing at Level 7. When Coach Vali opened ROGA, he asked Zach to join as a coach. He is grateful to be able to stay involved in the sport. Outside of the gym, he stays busy with high school and an additional part-time job. Coach Ian has been involved in the sport of gymnastics since he was 3 years old. At age 8, Ian joined team gymnastics and continued to compete for 3 years. When he was a competing gymnast, his favorite event was pommel horse. Being one of Vali’s previous students, Coach Ian was invited back to coach at ROGA when it opened. When he’s not at the gym, you can find Ian at CrossFit, snowboarding, or skating. Noah began gymnastics in kindergarten and went on to compete for 6 years. Noah loves gymnastics and starting coaching in order to share his passion for the sport with others. He enjoys being able to see athletes develop their skills over time. Noah also plays football and hopes to be an entrepreneur in the future.